Airsoft HQ is committed to Customer Satisfaction! Fully Automatic Rifles, Pistols, Revolvers & Handguns, Shotguns, Sniper Rifles, LMG Machine Guns and more! Airsoft HQ seeks to be the source of information, combat training and military simulations as well as bring you the best in affordable & high quality Airsoft guns & Airsoft supplies for your airsoft war games. Re-enact your dreams and the heroes you have aspired to by getting out onto the field in the most realistic way possible without having to join the armed forces. In man's constant advancement with technology the most recent examples of modern war games are evidenced by PC and consol games which are getting more realistic every moment. The realism and first hand experience of paintball started this craze and now it has evolved in the form of Airsoft. This has brought us to the cutting edge of modern war games. Now war games have evolved to the closest we can get to the real thing! 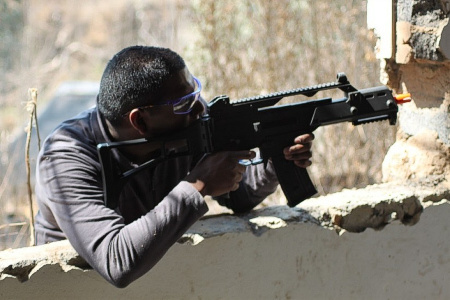 Airsoft is designed with regard to drills and systems using accurately reproduced weapons. War has been with us from the very earliest of times and consequently war games and training for war has been an integral part of man's existence. In ancient times when two men would swing swords and axes at each other in order to ready themselves for the battles that would inevitably be ahead, it became a social event, a challenge, a competition. In Modern times nothing has changed and it is inevitable that even young children can be found running around playing war in the age old struggle of good over evil. Even though boys grow up they still want to play but just seek more realism and the use of technology. Big Boys require Big Toys - We can help with that! Airsoft HQ committed to stock High Quality Rifles & Equipment! Airsoft is the ultimate in realism and is an honour based sport where almost anything goes - just as in real war. Airsoft HQ have a number of excellent venues which we can use for staging epic airsoft battles! 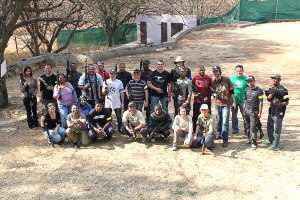 Airsoft is a huge and growing sport internationally and although a baby in South Africa it is increasing awareness very rapidly. 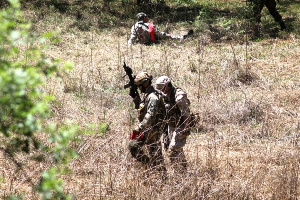 Airsoft teambuilding is designed with regard to drills and systems. Realism is the biggest attraction to the sport. Accurately reproduced weapons, more strategy and tactics, teamwork and creativity, bigger fields and more realistic situations. Anything goes in Airsoft. Can you afford not to check it out and get involved? Military simulations identical to the real thing! Movers & Shakers run tactical simulations nationwide and in the more remote regions of South Africa! We assist with advise for Upgrades, Repairs and Accessories! We not only focus on selling high-quality products that are fun to shoot, but products that are also reliable! Each product is tested for quality and workmanship and our suppliers are carefully selected. We stand behind every product we sell. You are welcome to come and visit us at our showroom by appointment. We want to give you undivided attention and kit you out with the load out that best suits your tastes and style of play. The options of weapons are absolute replicas of real-life army hardware ranging from fully automatic rifles; pistols revolvers and handguns; shotguns; sniper rifles; grenade launchers and even mounted LMG machine guns. All to the highest level of Airsoft quality to suit your pocket. . If you are based in Cape Town, Durban, Pretoria, Port Elizabeth or any other South African regions or even if you are based internationally we take care of all the shipping and you can purchase through our AirStore securely and conveniently online. Normally any order will leave our HQ within 1 working day. Airsoft HQ keep costs low and hence translate into savings for you. Not only do we have the best quality Airsoft rifles and equipment, we have experienced and enthusiastic Product Specialists waiting to give you the honest advise and recommendations. 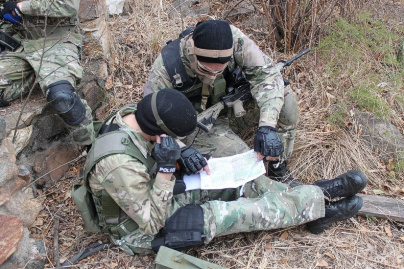 The Airsoft HQ team play themselves regularly and have loads of experience when it comes to kitting out the beginner or even more experienced airsoft players. We can assist with advise with upgrades repairs and accessories for almost any type of load out and if we can’t get it we’ll do our best to make a plan within reason. Our team love the sport which is why we try to support the sport not just by making all the Airsoft equipment easily and conveniently available, but by also putting on games and investing in promotions and exhibitions to promote the game of Airsoft to those not yet in the know. Order the hard-to-come-by Airsoft parts you require! Through our partnership with Redwolf, Airsoft HQ are now able to put together collective purchases on more specialised and hard-to-come-by Airsoft parts! AirStore now has it All! Airsoft HQ is certain that you will not have an airsoft need that we now cannot satisfy! We realized that we don’t know it all so we partnered up with RedWolf to put regular group buy purchases together to assist you in getting those rare little bits and pieces and more specialised items into your hands. RedWolf have over 15,000 products in their store and focus more on quality and high end equipment. They are even able to create the most amazing customised guns because they have resident gunsmiths and airsoft technicians on hand. Sourcing through our relationship with RedWolf is easy, relatively quick and inexpensive, not to mention hassle free. We take care of all the shipping, customs and S.A. Police inspections as well as import permit issues that you may normally encounter. Our experienced imports team handle all the red tape and the goods come straight to you. RedWolf's relationship with direct distributors and manufacturers allow us to keep costs low - and hence translate into savings for you. We will offer a money-back guarantee that your order reaches you safely! Monday to Friday 9:00am to 6pm. Strictly by appointment on Saturdays and public holidays. Monday to Friday 9:00am to 6pm. Strictly by appointment on Saturdays & public holidays.